The Uniting Reformed Church in Southern Africa, one of the closest family members of the Dutch Reformed Church, has appointed elder Desirée Brown as its first general secretary. PROF CHRISTINA LANDMAN, editor of URC­SA News, has asked the new general secretary a few questions about herself, and gave permission for Kerkbode to reproduce the interview here. Tell us something about your childhood. Where were you born, what did your parents do and what was your relationship with the church? I was born in Kimberley, which is the capital of the Northern Cape Province. Being the first grandchild born to the Appollis family, my loving grandparents took me into their care. I was raised with good work ethic and family values as well as a clear distinction between right and wrong. 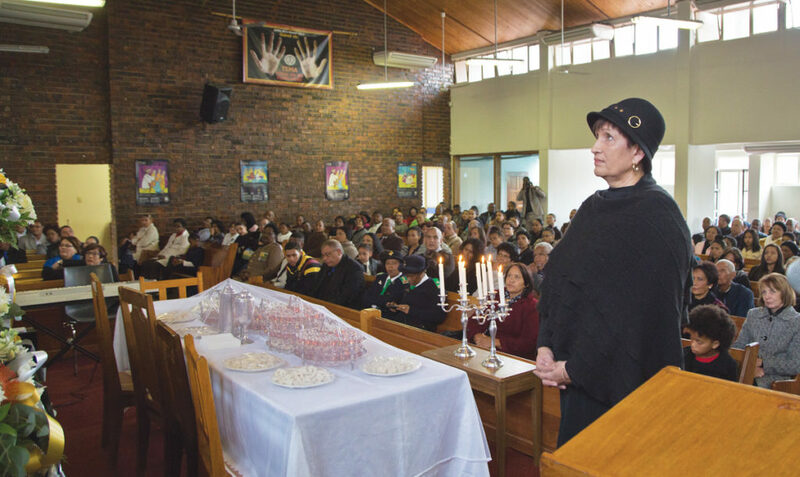 We lived approximately 400 metres away from the then Dutch Reformed Mission Church in Florianville, Kimberley, and for as long as I can remember we always went to church but for me, it was more out of duty than out of desire. Somehow, I realised very early in my life that it is not perfection that attracts God, it is participation, hence I was very active in the church. I joined the CCM, which was called “Kinderbond” at the time. As a teenager I attended CYM and was also a youth leader for three years. I accepted the Lord as my personal saviour at the age of 16, on the very day I was confirmed. As a young girl, I did not go to the scriptures to study, but I always had a hunger for the word of God. At the age of 23 I started serving on the church council as a deacon and gave catechism classes at our church. My adult life has been a season-to-season kind of thing, where God has been working on layer to layer to layer. I have seen God do miracles in my life and in the lives of others. I had good times seeing God do miracles in the church, but my best times were my experiences alone with God. Going to church is important, but it means nothing if we don’t go home and live it out. Throughout my church life I have been extremely blessed with God-fearing mentors like rev Jaco Coetzee, rev Mossie Willemse and rev Vincent Cloete. I presently still have the privilege of serving on the church council as an elder alongside rev Mario Ferris at URCSA Florianville in Kimberley. Tell us something about your “previous life”. Where did you study, what made you choose a specific career? I matriculated at William Pescod High School, Kimberley in 1976 and started my career with the then Barclays National Bank, now First National Bank, in Kimberley. I worked through the ranks for 10 years and because of seniority I became a team leader. It was only then that I decided to further my studies in banking through Unisa, and the University of the Free State and many other management development programmes provided by the bank. I was then appointed as a Relationship Manager in 2004 and later promoted to a Branch Manager and even later promoted to a Senior Branch Manager with a Credit Portfolio. I retired from the service of the bank in January 2015 after a service of 40 years. I enjoyed working for the bank, and I always asked God to make me bloom right where I am planted. Throughout my banking career, I met, and have worked with so many different people who have enriched my life completely, and I hope that I have enriched their lives too. Tell us something about your family – husband and children. My son got married and we were blessed with our first grandchildren. It was actually a double blessing because they were two beautiful twin girls. Not long after the twins were born, my daughter gave birth to a beautiful baby girl as well. We now have three granddaughters. After the birth of my two children, like most parents, I always felt that they were the best gifts that I ever received from God. However, that feeling only lasted until my grandchildren were born. The love for my grandchildren is an emotion that cannot be compared with anything else. My life purpose statement is to love Christ and grow like Him in character, serve Christ through the church and lead my family and others to do the same. What is your vision for your post as general secretary? As the general secretary I would like to prayerfully discern and explore the application of efficient and cost-effective measures to assist the body of Christ to fulfil its calling. Manage and lead strategically to realise the vision and mission of URCSA namely: A committed and united church in the service of unity, justice and reconciliation to all people through Christ.